In the Go RV warehouse, we have a Skamper Kampers Ranger soft-floor camper just begging to be hitched up and hauled bush by one lucky winner. Do you like what you see here? Go on, admit it. If you could take this camper bush, you would. I don’t blame you: it’s a nice setup. But here’s the best bit: this Skamper Kampers Ranger soft-floor, side-fold camper will be given away to one lucky Go RV reader. The Ranger takes the excuses out of camping. As one of the best-value camper trailers on the market, there’s no reason to wait until your ship comes in, the kids leave home, or you win the lottery. At $7000 ex-Sydney (dealer delivery charges would apply in other states), the Ranger offers solid bang-for-buck and enough features to comfortably get you into the bush or the outback. The 100x50x3mm hot-dipped-galvanised chassis is a continuous, one-piece unit. This means there are no joins or welds in the main chassis rails from the tip of the drawbar through to the tail of the camper. The sides of the trailer are constructed of 2.5mm checkerplate, so it will happily take a beating on rough tracks. As standard, the Ranger gets the tried-and-proven McHitch offroad coupling, which provides complete horizontal and vertical articulation, while a mesh stoneguard protects the drawbar-mounted spare wheel and checkerplate toolbox. Beneath the camper, you’ll find a 70L fresh water tank – enough to keep you going for three or four days away from civilisation – and beam-axle leaf-spring suspension fitted with one shock absorber per side. The 15in steel wheels have six studs with a Land Cruiser pattern. Along the nearside, you’ll find holders for two 4kg gas cylinders, a tap with manual water pump, and the fresh water inlet. The offside is home to two jerry can holders. The stainless steel tailgate kitchen can be used whether the camper is set-up or packed down. It includes a sink with hand-pumped water, utensil cupboard, and storage for a BYO barbecue. A two-burner gas unit would fit nicely. At the back of the trailer, you’ll also find a couple of quick-drop stabilisers and even a hitch receiver for a bike rack. Not bad at all. The ply tent base lifts on gas struts to provide access to the trailer’s tub storage space. Even with the awning walls and floor folded up inside, there’s acres of space here in which to store your camp table, chairs, kids’ bunks, sleeping bags, and even your surfboard. Two people who’ve done it a few times before will have the Ranger set-up in 15 minutes or less. Our giveaway camper has a 9ft tent (a 12ft tent is available), and an enclosable awning as standard. Side and front walls, along with a floor and a ‘skirt’ to close off the space around the swing-out kitchen, are all included as part of the package. Did I mention that a self-erecting tropical roof is fitted? As I said, this camper is very good value. In terms of the tent and awning, 15oz canvas is used with heavy-duty zippers, 600gsm PVC floor inside, 25mm steel poles and spreaders, and midge-proof window and door mesh. Inside, the tent is large enough to accommodate a portable bunk and small camp table, while the king-size bed with high-density foam mattress has a zip-up screen for privacy. Lift up the mattress and you can access the main trailer storage area via two hatches in the ply base. It’s a tad awkward, sure, but manageable. On a hot night, you can unzip the lower half of the canvas wall, on the offside of the trailer, for extra ventilation (there’s a built-in flycreen), or unzip the flyscreen too in order to access your jerry cans… not for fuel, necessarily, but perhaps one of them is filled with fresh water. Those who scoff that the Ranger is too basic or otherwise lacks equipment are entirely missing the point. No, the Ranger doesn’t have a radar dish, spa bath or chandelier. Instead, this camper offers an affordable and reliable way of getting off the beaten track now, rather than waiting until you’re old enough to cash out your super. Naturally, if you like what you see here but wouldn’t mind a few extras, just upgrade to the Ranger XL. With additional specs including a gull-wing toolbox, 12V water pump, larger tank, independent suspension, and an onboard 105Ah battery, it’s only 400mm longer and about 160kg heavier than the base-model Ranger seen here. Mind you, that extra 160kg of weight is, for most of us, chicken feed when you consider the Tare weight is still only 910kg for the XL unit. In fact, my wife’s Commodore wagon would tow either Ranger with ease. It’d be more at home behind my 80 Series, though. After all, the Ranger is built for the tracks of the High Country, where only a fool in desperate search of You Tube views would take a Commodore. So good luck to all who enter this competition. Our Ranger is destined to provide one of you with awesome memories… the only question is who. Authorised under NSW Permit No. LTPS/17/11644 SA Permit No. T17/267 ACT Permit No. TP 17/00292. Click here for terms and conditions. 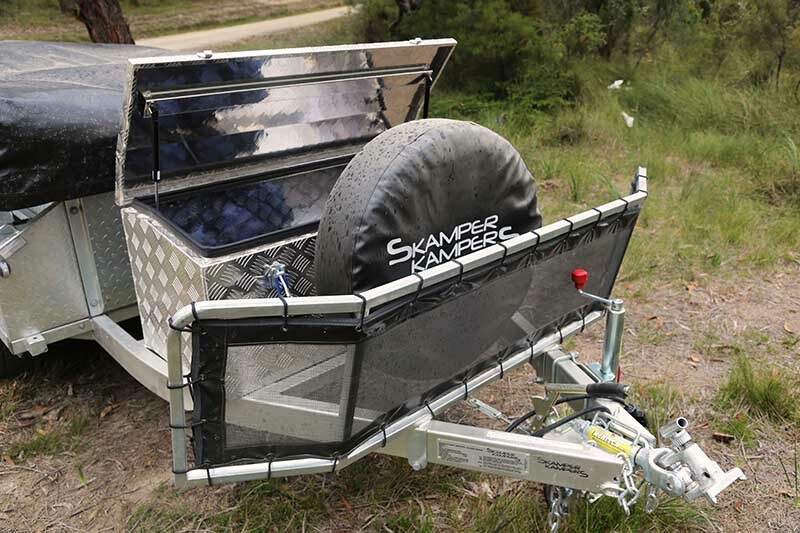 The Scamper Camper Ranger camper trailer is the type I have been looking for. It is light weight , easy to set up and is outfitted with all the comforts you need when camping. I have been looking for this style of a camper trailer and the Scamper Camper camper trailer appears to be the one. It is moderately priced, light weight, easy to set up and has all the comforts you need for an enjoyable camping holiday. I like the ease of setting this robust camper up and the generous sized awning this camper would be perfect for my bush getaways in my prado well done. If we should be so lucky; it’s what we spend our lives dreaming about. Only thing needed to throw in are the rods and a bit of tucker. Magic! The price is very fair. Looks a good unit for the rugged weekend or even the big lap to the top. Wouldn’t mind trying this one sometime. Value for sure. Camping is camping , but to do it in a camper so great and comfortable , spacious , and easy set set up , now that’s another story , and you guys have ticked all the boxes , ” Well Done’ !! Having just sold my tents and looking to up grade to a Skamper Kamper Ranger winning this would be unbelievable! !